At an altitude of 400m, is the picturesque village of Hrisso. At Hrisso, you can watch the large olive groves of Amfissia, the area of Galaxidi and the Corinthian sea. 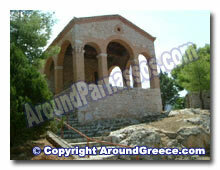 The name of the village is taken from the ancient city of Crissa, during the 14th - 15th century BC. 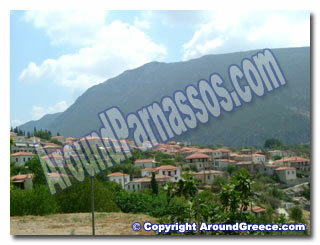 Hrisso is the first village you will pass through after heading southwards down from the ancient site of Delphi. Hrisso is a medium sized village, located amongst the slopes of a mountain, and has several interesting churches and monuments. Ruins of the ancient city are still there today a little further out of the village. 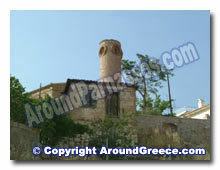 At the area of Stephani, which is 7km out of the village, is the monastery of Profitis Helias. During the revolution against the Turkish occupation in 1821, this monastery was used as a place to hide and to be secure for the heroes of the revolution. In the main square of Hrisso which has a spring water fountain, you will find some cafe bars and tavernas where you can enjoy a tasty meal under the shade of the large pine and almond trees in the square. The village is a very peaceful one, with lovely views down towards the coastal city of Itea and the delightful resort of Galaxidi. From Hrisso, travellers will pass through a lovely peaceful olive grove on the way down to the coastal towns of Itea and Galaxidi.